Not from a Box: Blend it up! For my inaugural post, I thought I'd introduce to you one of my favorite breakfast foods: the smoothie. Not only is a smoothie easy to make (I won't assume to tell you how to make one), it's a great way to get plenty of nutrients when you're in a hurry or on the go. I can't even count the number of times I've gulped down a breakfast smoothie -- and gotten all four food groups into my gullet in less than two minutes. A typical smoothie for me contains yogurt, a liquid of some kind (like juice or soy milk), and fruit. In years past, the constant star would be a combination of mangoes and berries, both frozen and thawed in the microwave. (I'm not big on the idea of putting ice or frozen fruit into a smoothie. It's seems pointless, as well as a good way to get brain freeze.) In college, I would throw in a little silken tofu for protein. It blends well and is almost tasteless. These days, since I'm on an "eat your greens" kick, I have been adding kale to my smoothies. No, your eyes are not playing tricks on you -- I really did say kale. Thanks to a tip from Mothering magazine, I discovered that adding a leaf of dino kale, my favorite variety, is a great way to add a vegetable to the most important meal of the day. During strawberry season, I whirled together a smoothie of vanilla yogurt, a splash of orange juice (for consistency mostly), a pile of red berries, a little honey, and a leaf of kale. This resulted in a pink beverage flecked throughout with bits of green. My boyfriend D called it a "Christmas smoothie." After I stopped buying strawberries, I switched to a smoothie made with yogurt, soy milk, banana, a large spoonful of peanut butter, a squirt of honey, and, of course, kale. Not only is a drink like that full of good things for your body (like calcium, potassium, vitamins A and K, and fiber), it really fills you up! 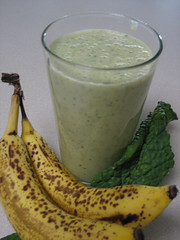 As noted in Mothering's recipe, you can hardly taste the kale -- it gives the smoothie a bit of a nice green flavor. D, however, would disagree with that. He doesn't like the way kale tastes in a smoothie. So add some greens to your next smoothie... or not. But keep in mind that the possibilities are endless when it comes to your breakfast beverage. Kale, eh? I'm not sold on it, though I do know that with strong flavored fruits like bananas and strawberries, the kale taste really wouldn't come through. I love smoothies, but I prefer them cold, so frozen fruit is the way to go for me. Smoothies for me are kinda like veggie soup or shepard's pie - I throw in whatever leftover stuff I have that's appropriate, and it gets rid of it without wasting it. I love smoothies too. I love kale and with the right fruits or veggies it might work for me. Congratulations on the start of your blog! I started my blog a year ago. It's been a lot of fun. Mike - Kale is either an acquired taste... or I'm going a little overboard on the healthy eating thing.